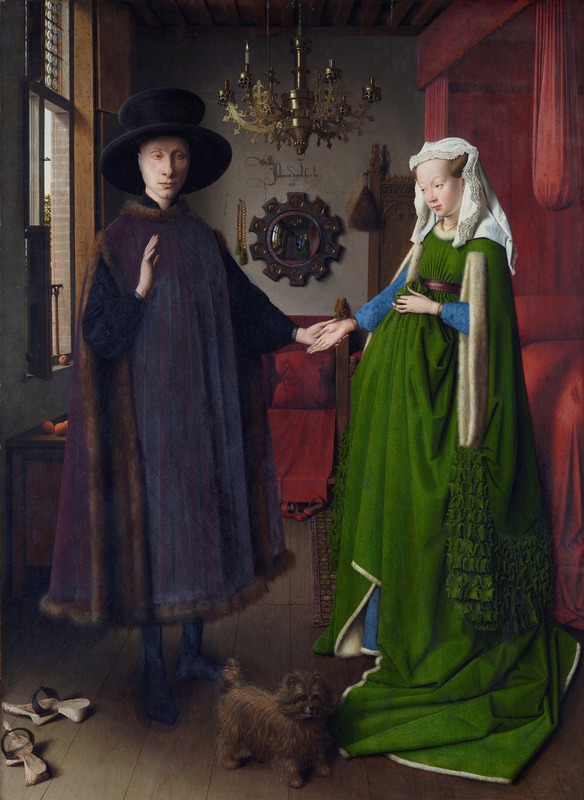 The picture of the Arnolfini Portrait by Jan van Eyck is in Wikipedia’s image library. convex mirror on the wall. 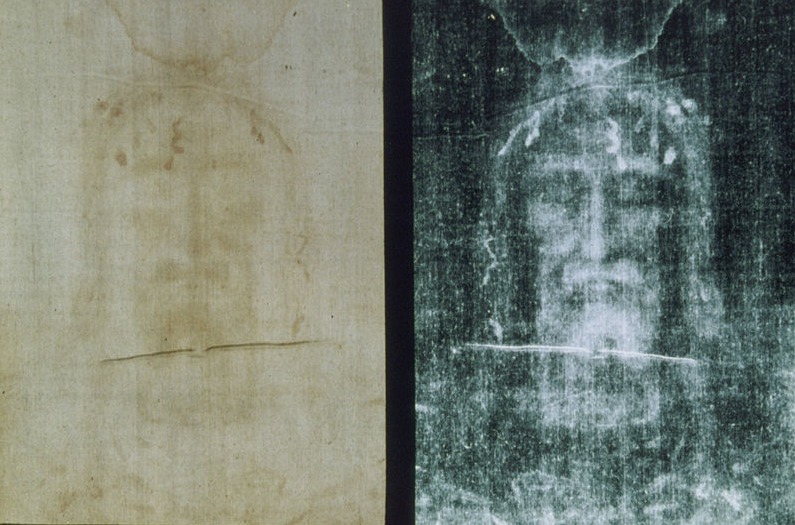 Colin Berry had repeatedly pointed out that the image on the shroud is a negative image. He was suggesting that it implied a contact imprint. Colin – what is the problem in creating as negative image? The artisT of the Shroud as well as the Besancon shroud, was commissioned to imagine an image that a dead body might have left. The conventional iconography of tHe side wound is on the right side of the body, so he produced it on tHe left. Not difficult. 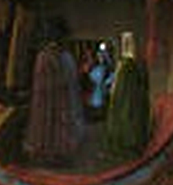 For a more sophisticated negative image look at the mirror on the famous Arnolfini portrait by Van Eyck in the National Galley, London ( 1434). There are other cases of mirror images but this is the best. Do you not know the difference between a negative image and a mirror image?
. . . Here we have negative images of Christ’s body as if they had been transferred from the body to the cloth. . . .
. . . Note, too, the blood dripping from the lance that, in the negative image of the Shroud, appears to be reproduced outside the body image on its left side. . . .
Left side! Is this a clue? And then in an extraordinary paragraph at about three quarters of the way on, you tell us. Do you not know about Secondo Pia’s famous photograph in 1898? Do you not know what it means? I am working within the mainstream, not Shroudies mainstream, but academic mainstream in setting out my hypotheses. No one who has read my articles thinks I am saying anything more than placing the Shroud within an acceptable medieval context. Acceptable medieval context? Show me one example of someone painting a negative image in the medieval or anytime in history. Find me an artist anywhere in the world who can do so. I’m sure it is possible. So, too, I imagine is patting your head, rubbing your stomach, jumping rope and singing the Halleluiah Chorus backwards all at the same time. Try it. No, I mean try painting a negative without a negative to copy. Try it. There is something more going on in the picture on the right than a mere mirror image. It’s a negative of the picture on the left. And since the picture on the left is, itself, a negative and since two negatives make a positive, the negative on the right is a positive. Charles, check out this negative thing with academic mainstream. Without an example, you do not have any medieval context. One more question, in three parts, Charles: If all the paint has flaked off, how do you know the images are limited in tone? How do you know it was not painted in rich colors? And, was this a color negative painting in which colors as well as gray scale values are reversed? Without an example you do not have any medieval context. Give to Jan van Eyck what is Jan van Eyck’s and to shroud what is shroud’s. Well said Dan, Charles dismissal is akin to Hall’s famous “Someone just got a bit of linen, faked it up and flogged it”. 25 years later where does his words stand but in the dumpster of history. The shroud is still being studied and yet remain as mysterious as ever, still going on exhibitions with millions to see it, still venerated by the Pope and still making headlines in the news. I can’t see anything in the photographic negatives that I could not see in negatives when I was being taught how to develop my own photos as a schoolboy in the fifties. They were equally haunting. In a year’s time I shall gather all the supportive academic comments by specialists and we can judge my article. Really it is much too early to make a snap judgement but I am quite confident from what feedback I have had. Too early to start deriding me, I think. But a start would be to provide evidence to date the Shroud firmly to before AD 33. I cannot see how the Shroudies are going to be taken seriously until they have. The painting. If you read up on painting on medieval lInens you will realise the amazing sophistication of some of the artists, several pigments mixed with each other and then painted layer on layer. The Shroud is very primitive in comparison- probably only two pigments in all. No evidence that the colours were revered. THe descriptions we have suggest that the emphasis was on bloodstains- at least this is what people noticed. As vermilion was the normal,pigment used on these linens for bloodstains, this would be the first pigment to expect to find. You still don’t get it do you Charles re the TS negative character.? This latest comment demonstrates that beyond a shadow of doubt. It’s not your ancient negatives that had the haunting character. Odd and unsatisfactory maybe, but not haunting. It’s what you see when you convert them back to their positives that is remarkable, had you been seeing the final positives for the first time. Now trurn that on its head. The TS image is NOT a positive. It’s a non-photogenic negative. IIt was Secondo Pia’s ‘inversion’ of light/dark that created the haunting image that no one had hitherto suspected was there. It’s the subtlety of the TS image , both as-is, and the way it responds to modern technology that should have told you the TS was no ordinary image, certainly not painted. Flaked-off paint? The onus is on you to deal with Occam’s Razor. what are the odds that a13th century person made a completely NEGATIVE image of back and front human crucified body that is photographic quality before photography was invented versus a relic surviving from the first century that shows a crucified man very blurry but when run through newly discovered technology 1900 years latter yields a image that was not apparent to human senses. I am no expert in statistics but would guess it’s billions to one. I would say this would make the 13 century fabricated object more spectacular than one surviving from the first century made by natural? means. I think this negative issue is a false issue, not being seen as a problem by anyone other than the Shroudies. Photographic negatives always look haunting, at least mine did. 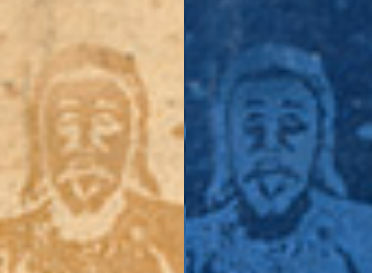 I have given two examples in my article of similar faded images. Why are the images of a head of a man standing up? That is not a mystery If the artist was copying similar images, of which there are thousands of a bearded Christ and many fourteenth century exampleswith the blood trickling down( as in the Holkham Bible images and the Roettgen Pieta). It is a real problem if you think this image comes from a man lying down- insurmountable in fact. Then there is the mismatch of the arms of the back and front images. The artist needed to get so something functional to use in the liturgy and other than transferring the wound from one side to the other he could hardly have been said to have taken much trouble. As someone has recently said to me, the artist would never have imagined that the faded remnants of his painting would cause so much fuss! The mystery is in greyscale. The Shroud has full greyscale image compressed in almost a single tone, so it is unresolvable for a naked eye -it needs photographic process (i.e. creating another negative -that is positive image) to extract the the true image of the Shroud figure. Good point DavidM. Yes of course one can take a reasonable image off a bas-relief like a coin, despite the shallow relief. It will be a negative of course, but it’s an easy matter to reverse it back to a positive. Here’s one I did with the tail side of a UK 2p coin. That’s coin -> negative -> positive. The medievals almost certainly knew how to rub ornamental brasses in churches etc, so would have had no trouble recognizing a negative image when they saw one. Painting one free hand would have been an entirely different matter altogether, virtually impossible I would say, as Dan rightly points out. If an artisan had wanted to produce a notional sweat imprint then it’s my guess he’d have made a template first and imprinted off that. So we’ve had photographs, thermographs and chemographs. What’s the posh name for a rubbing? What kind of -graph? And there is no reason why you should NEED to reproduce a decayed image. Suppose you lost your wallet out on a hike and found it ten years later, you would remember what it once looked like but probably the papers in it would have decayed, the photos faded, the leather decayed. So the issue of reproducing as it was found would be a non-starter as it would be unlikely that you would have an original to start with and then recreate all the accidents of the period at it was lost over the ten years to come up with anything like the wallet as you found it. There would be no scientific record of all the events it encountered. The Shroud is surely similar , unless you really do believe that it has remained chemically constant throughout several hundred years ( unbelievable I would have thought). You would know that you could never recreate the effects of time and rain and unfoldings ,etc, etc, to reach what you have now. What you can do, and I am hoping to do, is to find other faded cloths- I already have two in my article- that you can compare with the Shroud. The problem is that in medieval times we know they were often thrown away( as we have documentary evidence saying that a new banner needed to be made because the old one was worn out) and museums will hardly have on display faded cloths! But this surely this is the best way forward.what remains on the Shroud today is unreliable evidence of what there once was . Now I think I can take a break! You have a cloth that originally had images on the outer fibrils (STURP finding but in line with medieval manuals), the images have faded ( hardly surprisingly after a minimum of seven hundred years) and you then make a photographic negative of what is left today. No wonder you end up with something that looks rather mysterious! How you follow on from that to suggest that this is the burial cloth of Christ defeats my(obviously very limited) understanding! Am I right in saying that STURP assumed that the Shroud has remained chemically constant for perhaps two thousand years. Do they state that clearly and give their reasons for so believing (I can’t remember the point being made explicitly but it seems to be assumed)? If, against what one would assume, there has indeed been no chemical change between then and now. I think you have converted me. However,I do need to see the evidence not only of the lack of chemical change but of how the Shroud survived for so long without any part of it decaying. Ian hard to,convince because of the many descriptions of the images being so much stronger than they are now. It doesn’t matter that the images are on the outer fibrils. It doesn’t matter if the images have faded or not. It is not a matter of making a photographic negative and ending up with something that look rather mysterious. If anything it is the other way around. Charles, the images on the cloth are negative images. What that means, if your painted image hypothesis is to be thought valid, is that 1) an artist painted a negative image or 2) an artist painted a positive image that as it faded (or is it as the paint flaked off) became a negative image. There is no evidence that this has ever happened in the history of art. Moreover, option 1 is near impossible to do and option 2 would be a startling scientific phenomenon. Actually if you could explain how option 1 is doable or option 2 is scientifically possible, you might have something. Otherwise, your hypothesis is baseless. Which is it? That is a simple question. Again, some other questions come to mind: In defense of your hypothesis, do you know what Secondo Pia discovered in 1898? Can you describe the difference between a mirror image and a negative image? Do you have any evidence of a painted grey scale negative image at any time in the history of art? Saying that medieval artists were ingenious or something like that is not evidence. Now you are well and truly into bull s****** territory Charles. Tell us of the “many descriptions” of the image being “much stronger” than now. Thomas. – start with the five descriptions I give in my article of the predominance of the bloodstains, 1449, 1474, 1503, 1517, 1534. Then there is another that David Mo has added in previous posts. Is that enough for you to be getting on with? Charles, keep bringing your straight talking to this blog. It’s much needed. A couple of points. The shroud could have been made as a contact print and that’s why it’s negative. Perhaps it was then painted over resulting in the vivid image that was obvious when on display. The paint is now lost and we see only the contact print. The image in your article for ‘exposition of 1608’ shows that the image was in a negative form (though presumably vivid). Here’s the face from that image. The original image is on the left with the negative (therefore positive) on the right. Vulgar language has begun to show its head again on the blog. there’s a place for vulgar language…..well moderately vulgar and blanked out…Charles is taking the……..mickey. The references he lists ARE NOT references to an image that is much stronger than now! I mostly read the blog and rarely comment because I’m not a scientist but a postal worker! I’m starting to lose interest in this blog because of this ridiculous painting theory that just goes on and on. Charles is not a scientist, so can we just please move on to something more plausible? I am actually starting to agree. Not because of the lack of a scientific base, but more because of Charles continuous disregard of people that are trying to engage him. The “I am now working with *real* academics” reply is getting old… Fast. On 9 November at 1.07 pm you said ‘the many descriptions of the images being so much stronger than they are now’. I interpreted this as referring to the body images. But then your subsequent comment seemed to suggest that the historic references to images being stronger than now referred to the blood marks. Yes, you START with the bloodstains that make the point that the Shroud looked very differently in the fifteenth and sixteenth centuries from what it does today. It seems important to stress this as there are still people who argue that the Shroud is chemically unchanged from seven hundred, even two thousand years ago,. You then GO ON to look at the depictions of expositions. I use the Tempesta 1613 engraving as my first example, partly because we know from his meticulous view of Rome in 1593 that he was very accurate and partly because he was resident for some time in the royal court in Turin and it seems clear that he saw the Shroud on several occasions. It is not just the images are much stronger (as they need to be if you are going to get crowds to come and see the expositions ( now with the faded cloth you have to get up close to see anything)) , it is that you can see features you can no longer see, the Crown of Thorns on front and back of the head, the long hair at the back, the gap between the elbows and the body of the back image( showing that the crossed hands are impossible if this is the same body) , the loincloth ( after 1578). As I then note this is only one of perhaps fifty depictions of expositions . As they are made by different artists at different times , largely between 1578 and 1750 when – probably because the images were beginning to fade so large scale expositions are not so impressive- they diminish in number. You then need to work on a data base. For instance from the Royal Savoy catalogue depictions of 1998, I have taken thirty photocopies and every one shows the loincloth in place and it seems to be the same loincloth recorded by different artists. A lot of the depictions show thumbs on the hands. As I argue in my article and would repeat here, we desperately need to do what should have been done years ago and create a data base of all the depictions so that we can confirm what features there were one on the Shroud but which now can no longer be seen. What is without doubt is that the images were stronger, they contained features no longer there, and that the bloodstains were in the fifteenth and sixteenth centuries the features that stood out. N.B. Contributors here have talked of paint flaking off. No, these were medieval ground pigments and they would have been in small particles. This is why the disintegration of the paint would have been very different from modern oil- based paint that, as we all know, does tend to flake off. No one can possibly say that I don’t put out my arguments clearly and that I concentrate on hard evidence. But as my article says all I need to say( although you need the print edition of History Today to see how the flow of blood on the Shroud matches the Holkham Bible) and I have now provided the footnotes at charlesfreemanuk.tumblr.com, I think I can leave everyone , on this site and on others to get on with it! No one has any excuses for not knowing what my arguments are so I do not need to repeat them further. Phew! So I’ve looked at the references in your article Charles. They refer to the prominence of the bloodstains. There is no reference to prominent body images. Indeed, one could deduce that the prominence given to the blood marks is quite suggestive of the body images being faint ie. more might have been made of the body images if they WERE prominent. And I repeat, the Clare nuns referred to ‘traces of a face’ – highly suggestive of a faint, but nonetheless visible, face image. Like today. Summary: none of these references suggest in any meaningful way that the body images were prominent in the 1400s / 1500s. In fact they are suggestive of the opposite! Were the blood marks more prominent than now? Quite possibly. one would expect blood marks to fade over time! But even today, any one who views the Shroud with their naked eyes, without digital image enhancement – such as I have done – attest to the visual predominance of the blood marks over the image!!!! Do you know any description of the Shroud in the early years that say the image of the body is evanescent or difficult to see? No but so what? We have a very limited number of written references to rely on. And you seem to ignore the reference ‘traces of a face’. If that does not point strongly to a faint image then I don’t know what does. And the two earliest artistic depictions are clear attempts to depict the faint ness. Please don’t give me ‘the paint faded on the 1516 and 1568 bodyimages’. The writing and poker holes on both images are very clear. The 1516 depiction is by a skilled artist who has as well as anyone depicted the subtle light and shade of the Shroud including the non imaged areas eg. Behind knees. I can’t discuss with a deaf. “Traces” doesn’t means faint. The clarisses sisters said they were some parts of body clearly impressed. “(Le né comme la partie plus éminente du visage est bien imprimé“). The evanescent aspect is a relevant feature of the Shroud image today. It is ever mentioned when someone is describing it in the recent days. No one in the early days You can conclude yourself. Am I the only one to be struck by the discerning use of the term “bien imprimé“”. Spot on, ladies. It is indeed an IMPRINT (not just any old painting, as some would have us believe). When early observers go to the trouble of pointing out a couple of features they observed to be more prominent than the rest, might that not to be taken as a clear indication that the rest of the image was faint, right from the word go? And we know the superior imaging of the nose and other raised facial features exists to this day. What’s more it can be readily explained (via that “imprinting” mechanism again, coupled with imaging according to apparent ‘relief’ as in ImageJ etc). “Clearly impressed”….even today we can see the image, even if it is faint. Perhaps the image was somewhat more prominent and easily seen compared to today, that could definitely be possible. But that means little. However the image was formed, we should expect some degree of fading. But an image that was slightly more visible than now is a big gulf from a fully painted and very prominent image! A. − Suite d’empreintes, de marques laissées par le passage de quelqu’un, d’un animal, d’un véhicule; chacune de ces empreintes ou de ces marques. About the copies you mentiion I have already replied in a previous comment. I don’t say that the rubbing on the coin produces automatically and strictly the same effect that the Shroud. I just said it produces a negative effect. Only that. If you want more precise matching with the shroud you should engage a skilful artist and to use a bigger object than a coin. You can also use more accurate tools to correct the basic image of rubbing. A pad, for example. You can also use a technic of successive fine veilings, as Leonardo sfumato and the Dutch painters of the 14th century. The result will be a very modulate patina. The “pompiers” in France were masters in that effect, although they were horrific painters. Some drawings with these technics (rubbing) are been made and they have similar properties than the Shroud. The main objection is that they were bad fixed to the cloth and would be erased with the folded. Nevertheless, Charles has shown how some painted clothes in the Middle Age were used as banners or liturgical objects without problem. This problem is overcome if we consider the possibility that the Shroud was retouched, as it seem be the case of that of Besançon. So the paint on the body image could fade away but not the paint on the side wound, or the poker holes…. I did express a view re the first of those two (Lier 1516 copy) in reply to Hugh Farey a few days ago. Does not 1568 also represent an attempt to depict the faintness albeit not as skillfully as 1516…with the head shown more prominently as per the shroud? One has to be a little more careful with the 1568 Guadaloupe copy. If all one had was the frontal presentation one might conclude it was essentially reinforcing the Lier with its fuzzy image with no obvious outline. It’s the dorsal view that is problematical. At first sight it simply looks fainter, so one could say “ah that clinches it – faint from the word go”. But look more closely and you see the dorsal has an entirely more conventional solid outline, albeit very faint. Why was that? Did the artist merely do an umber wash outlne first and never get round to infilling? If so, then why is the dorsal head complete? One possibility I guess is that he got cold feet at having to draw bare buttocks. If that were the case, then one could excuse him that prudishness (or cowardice) and conclude that overall the 1568 is highly derivative of the 1516, making precisely the same point, namely that the TS body image is (and always was) faint to the point of invisibility. Just as well we have those blood stains and scourge marks to help us see that it’s meant to be the imprint of a naked man, eh what? Where have Charles and David disappeared to? References to ‘impressions’ and ‘traces’??? Just above you,Thomas , at 2.31 am! I have given two weeks to monitoring and responding to objections to my article on this site but as it is there online for all to read I shall leave it at that. At the risk of being repetitive, whether my article succeeds or not will not be decided on this website but I hope I have shown that I am ready to debate with all comers in a civilized manner. I certainly feel I have put in points that have never been discussed before e.g. did STURP assume that the Shroud was exactly the same when they examined as it had been seven hundred years or perhaps even two thousand years ago. That is one for them to reply to. Well, it’s still recognizably linen after at least 600 years, so that tells you it’s been well-protected by and large from atmospheric moisture and micro-organisms. There’s been exposure to water of course, but that was limited mainly to a single ingress, given the repeating pattern across the fabric. There’s the 1532 fire, but Adler, Rogers and others were resourceful in looking closely at the encroachment of scorch areas onto blood etc to seek evidence for known artists’ pigments, and could find none, bar a few adventitious flecks, probably from elsewhere..
Apart from occasional displays it’s also been protected from sunlight and its bleaching uv component too for most of its history, being housed in reliquaries etc. The degradation of paint pigments. like any other chemical reaction, has an energy hump to overcome, the so-called Arrhenius energy of activation. Take away the sources of that energy – radiant, chemical, biological etc.- then there’s no a priori basis on which to assume fading as a matter of course. Tut’s tomb with all those bright murals etc preserved in the dark interior of the Pyramids with dry desert air should serve as proof of that. There’s also the small point that artists over the centuries have selected pigments not just for their instant impact but their longevity over months, years, decades etc.both in terms of colour and resistance to delamination and/or crumbling away. Colin: The clarisses were believers and not critical enquirers. How do you want they said the shroud was painted? You sometime think in medieval testimonies as current ones. You have to analyze the kind of witnesses before to deduce any conclusios. Sorry DavidM, I’m not into archaeo-psychology. Nor do I care for the INIT school of debating rhetoric (INIT = It’s Not Inconceivable That…) it making my eyes glaze over. The TS is an faint NEGATIVE imprint, with no solid evidence for thinking it was ever anything significantly different from what we see today. Blood is a different matter, given it can be acquired or applied like paint that subsequently flakes off (with indications from contrast-enhanced Shroud Scope images that it has done precisely that in places – but with a crucial give-away to the chronology, namely the presence of pigment traces that are still hung up in the interstices of the weave). Archaeo-psychology?? Considering the point of view of the author is the main rule for textual criticism! Have you any evidence for thinking it was significantly the same what we see today? Some testimony about the fainted aspect? When all you have is a few words attributed to folk who lived centuries ago, you cannot possibly know what was in their minds without further evidence. It’s simply unhelpful to claim a superior knowledge of what they thought (“archaeo-psychology”). It’s simply debating rhetoric that some of learned to spot as teenagers at the school or university’s debating rostrum, so kindly give us a break. Testimony about the image as it used to be? I’m not the one asserting it used to be much more visible at a distance. It is Charles Freeman who has made that a central plank of his argument that the image we see today is not the one that existed in the mid-14th century, using that to dismiss all the post 78 evidence re special character (negative, 3D-enhancible image etc etc). “Bien” iimprimé? I lived in France for several years and still keep a home there, so see no problem with “bien”. It simply means “well” as in “well imprinted”. I am well fed up with certain people’s debating style on this forum. To ignore comments might seem like rudeness. To respond to them in detail takes one away from more important tasks. Colin: I write synthetically because I have not many time and because my English is not very good. Others in this forum have more time and/or better English. The study of the point of view of the testimony and its assessment is not a game for children. It is a common rule to the textual interpretation, History, Ethnology and other branches of the social sciences. I don’t know if you have read the complete testimony of the Clarisses but you ought to take its passionate piety into account if you want to evaluate its objectivity. The human sciences are not natural or formal sciences. This simple fact is usually neglected by those who practice natural sciences. I never would say that a text with illegible/faint letters is “well impressed/printed”. Because this expression implies “clearly visible”. If the printing house sends you a galley proof as faint as the image of the Shroud, surely you will return it and will say: “Do it again, please. This is not well printed”. Yes or not? Are you now too busy to answer the questions I asked you about negative images? Well yes, because I think they are essentially a myth that only Shroudies seem to be able to see. Of course, a negative photo of a cloth with decayed images on It is going to come out all mysterious. You don’t reason from that that it is the authentic burial shroud of Christ. You get on with the job, that is central to the work of every archaeologist and art historian, ‘ how did this look when it was first created?’This is my focus and I have put forward some answers. But I really, must get on with other things. You have so much material from me to work from! “Material”? Pardon me for asking, Charles, but where’s the tangible evidence for your view that the TS is just a faded painting? There’s none that I can see – just idle ho hum speculation dressed up as historical scholarship. Sorry. You delude yourself Charles (and sadly the readers of ‘History Today’). Your refusal to accept the unique characteristics of the Shroud’s body image makes any so-called historical analysis totally irrelevant and meaningless. It’s as if Stonehenge had been described as a stage in the evolution of the Wiltshire semi-detached house. “How did this look when it was first created?” Charles, you say that is the central work of every archaeologist and art historian. Let me ask you then: How did it look? Were the images negative images when it was first created? If so, how is that possible? Certainly, they were not painted. 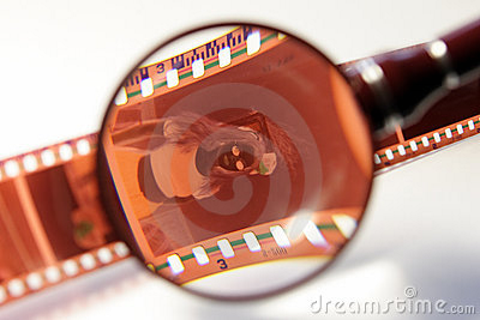 But if not, what happened to change the images into negatives? We are not talking about “a negative photo.” And it is irrelevant that the images are decayed (or faded or flaked away), as you say they are. And no one is saying that anything therefore or otherwise comes out mysterious. And nobody, but nobody, is reasoning from that that the shroud is the burial shroud of Christ. Who, Charles? Can you show me one instance of a painted negative image in the history of art? A mirror image doesn’t count unless it is also a negative image. And a negative image does not need to be a mirror image. Sorry Collin: “par extension, in Medieval French: “empreinte” = Trace. Imprimeer = laisser une trace”. See “trace” above. The Clarisses are thinking in a trace of a body from their religious point of view. And no more. well, Colin et al, it’s time to move on from this ‘debate’ I think. David Mo and Freeman have made it plainly obvious that they are sticking to their view regardless of the credible evidence to the contrary. I look forward to further work from Freeman where he actually cites his expert mates, rather than cryptically refers to them anonymously, and backs up. BTW ‘The Clarisses are thinking in a trace of a body from their religious point of view. And no more.’ Now that’s Ingenious!!!! The body image are subtle with fuzzy borders while the text that runs along the entire shroud seem to have survived relatively intact. Thanks Henrik I did not know of that depiction. This builds on a very strong evidence base that strongly points to the Shroud image having always been faint. incorrect—paintings do not age, have the paint flake off, and then miraculously become 3D negatives. That’s one miracle I cannot believe in. So yes, the painting does fade over a period of say 500 or 600 years, and then Secondo Pia comes along in 1898 takes a photo and his negative looks like a credible original, and in 1931 Guiseppe gets an even better one, Charles has out-miraculised the miraculuists! Colin’s arguments adequately dispose of the theory.